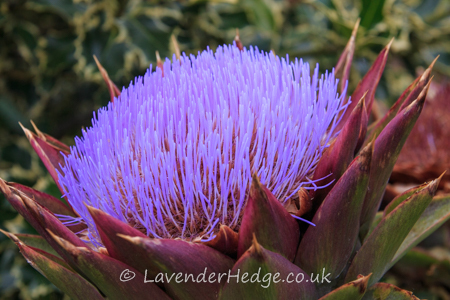 You can eat the young artichokes before they flower and they are said to be very tasty. However, I have always grown it as an ornamental plant to attract bees to the garden. This variety is Cynara scolymus Large Green and the flower looks attractive for many weeks. A word of warning – don’t grow it near a path as it is very spiky and invariably flops over. Towards the end of the summer when the leaves start to look very tatty, I cut them to ground level as necessary. It is said to be frost sensitive, but this one survives living in our heavy clay soil, surrounded by shrubs.